In a letter to Department of Transportation Secretary Elaine Chao, NSPE emphasized the essential role of professional engineers in the nation’s transportation infrastructure. NSPE President Kodi Verhalen, P.E., Esq., F.NSPE, stated, “professional engineer’s education, experience, and professional obligations to protect the public health, safety, and welfare place the professional engineer in a key leadership role in ensuring infrastructure innovation, rebuilding, and growth. NSPE sent a letter to the Office of Personnel Management urging the department to revise its individual occupational requirements for all “Professional Engineering Positions, 0800.” OPM’s use of the term “professional engineering” to define positions that are not professional engineering positions creates substantial confusion about job scope and responsibilities. Education and experience requirements are a vital component of the engineering licensure process. 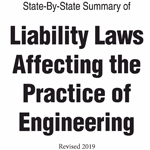 In a new report, NSPE provides a comprehensive overview of state requirements so that NSPE members, state societies, professional engineers, and the public can better understand the laws and regulations that define these requirements for the professional engineer. NSPE submitted public comment to the House Appropriations Subcommittee on Interior, Environment, and Related Agencies urging them to fully fund the US Chemical Safety Board in the Fiscal Year 2018 budget. NSPE and the Nevada Society of Professional Engineers beat back legislation (A.B. 353) that would erode occupational licensure in the state. NSPE and the Maine Society of Professional Engineers are opposing legislation that would eliminate continuing education requirements in the state. Currently, professional engineers licensed in Maine must complete 30 professional development hours every two years.